Infiniti was one of the very first manufacturers to enter the luxury compact utility vehicle fray. It is hard to believe that anyone could have imagined just how successful this category would become in the years that followed. Today this is one of the fastest growing segments with new competition being added often. So how can the original stay competitive? Well one way is by offering an absolutely fantastic engine. Most of the CUV’s in this category are powered by turbo-charged 4 cylinder engines, even the Germans have adopted this new smaller is better mantra. 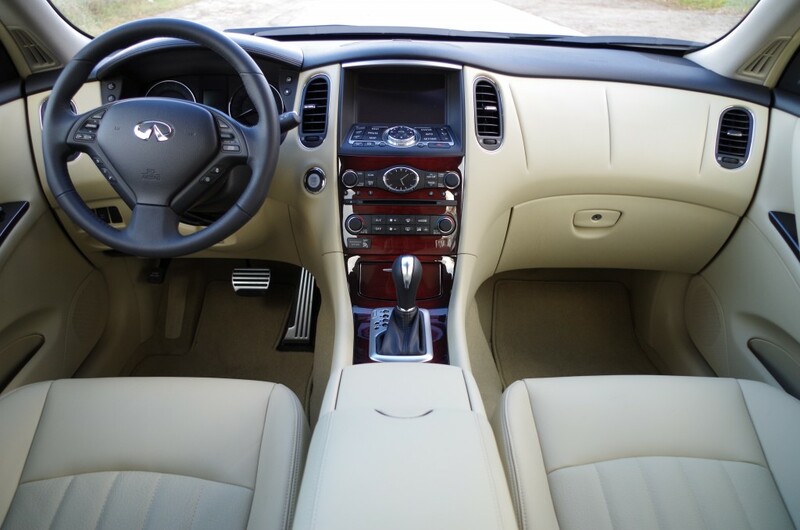 But Infiniti said no, for now at least, and have continued with the powerful 3.7L V6. This buttery smooth beast has two distinct personalities. The first is a laid back, comfortable and efficient daily drive persona. The other one, the one I spent the bulk of my time with is a little, no, a lot more sinister. Press the accelerator and the QX50 responds immediately, even quicker in Sport mode. You are hustled along by a wave of torque that will have you looking back at the distant traffic you have left behind. The engine produces a distant rumble as it cruises along with no load, but mat it and the sound that fills the cabin will put a school boy grin on anyone’s face. Unlike their parent company Nissan, Infiniti has not fallen for the CVT, and I for one am grateful for that. 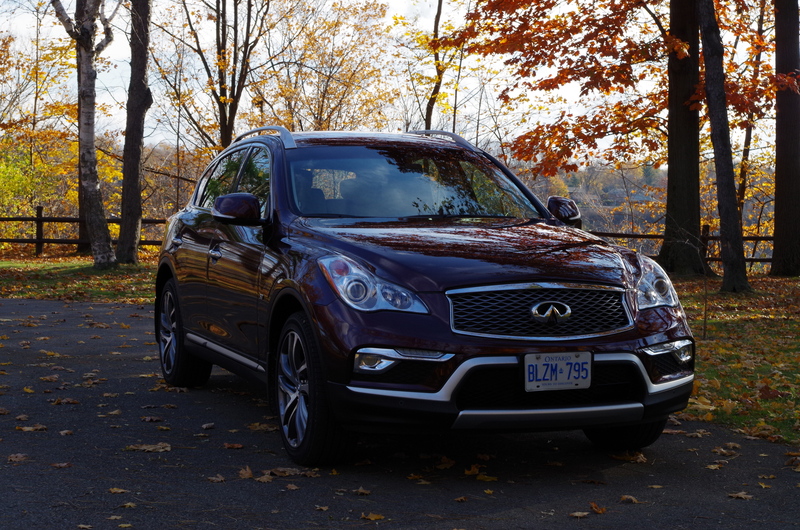 The 7-speed auto in the QX50 serves as a beacon of how good an automatic transmission can be. The shifts are definite and quick, and it always seems to be in just the right gear for whatever situation you find yourself in. One area of criticism that has followed the model from its beginnings as the EX35 is the lack of interior space. The trouble with being an agile powerhouse is you need to stay trim in order to keep your athletic demeanor. So for 2016 Infiniti has brought over the long wheel base version from China. This strategy is very smart and the extra space is much needed. But what is even more amazing is how unchanged the exterior appears. 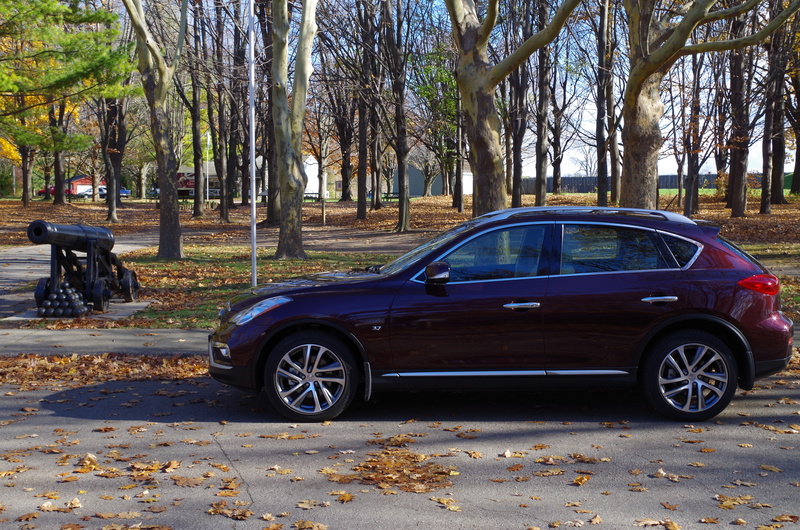 If you were to park the 2015 and 2016 side by side aside from the obvious difference in length you would be hard pressed to distinguish between the two, which is great as the QX50 is very handsome. There have been some minor exterior alterations like the new grille and LED running-lights, but the sport wagon silhouette is still present. So just how much bigger is the new model? The wheel base has been stretched 80mm(3.2 inches) but the overall length has grown by 113mm(4.5 inches). 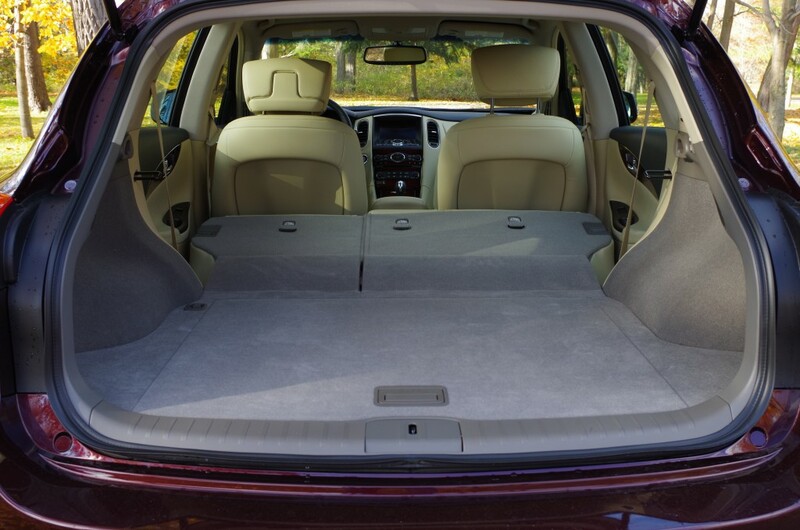 The most noticeable use of this extra room is in the rear seat. I am above 6 ft tall and with the seat in my driving position I was able to get behind the driver’s seat. With the driver’s seat in my wife’s driving position, I had leg room to spare. The interior is still on the narrow side but with the extra length the new model is far more usable and offers more competitive levels of cargo space and utility. 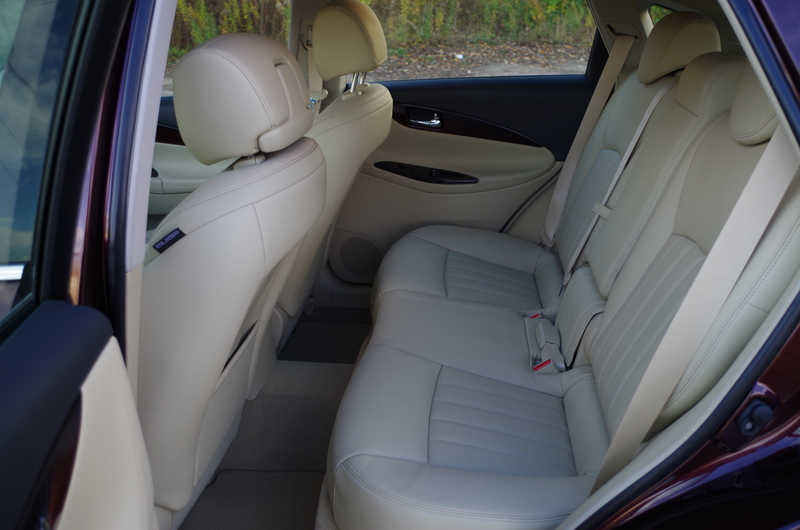 Infiniti make some of the nicest interiors available today in my humble opinion, and the QX50 is no exception. Everything fits perfectly, everything is soft and luxurious to the touch, and the dash and control layout is easy to learn and attractive. The leather seats are snug and bolstered firmly to keep you in place should you choose to aggressively corner, but otherwise they are all-day comfortable. There may be some who long for a larger infotainment screen, but I am not among them. The Bose stereo features 11 speakers including a dual base speaker that fits within the spare tire. The sound quality is so good you have the sense of being front and center at a concert. I also love the analog clock, it’s just classy! The QX50 is available in one model only-QX50 AWD. The AWD system is a treat that feels like it is a rear driver because of the rear wheel bias programmed in adding even more sportiness to the drive. 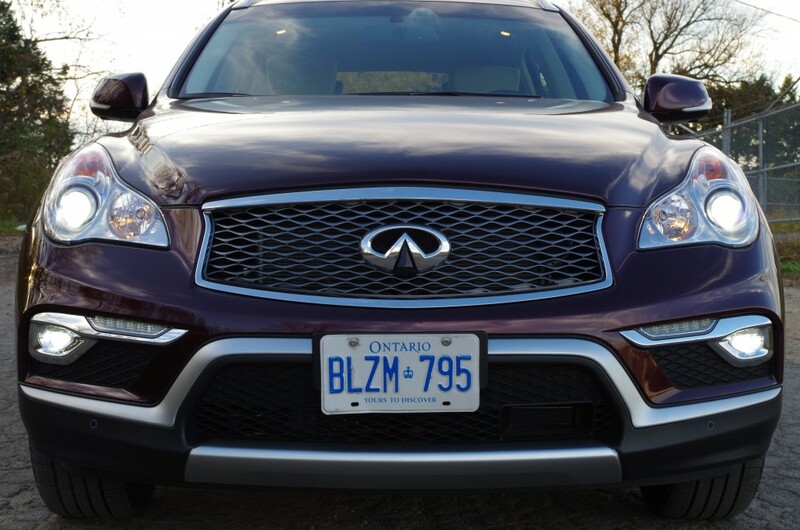 What Infiniti have done is offer 3 different packages offering some or all of the various extras like adaptive cruise control or lane keeping assist. The packages are Technology, Navigation and Premium. The Technology package adds Lane Departure Warning (LDW) and Lane Departure Prevention (LDP), Intelligent Cruise Control (Full-Speed Range), Distance Control Assist (DCA), Intelligent Brake Assist (IBA) with Forward Collision Warning (FCW) and Blind Spot Warning (BSW). The price$2,500 and well worth every penny. The Navigation package adds Navigation, Around View Monitor (AVM) and Front and Rear Sonar System and Streaming Audio via Bluetooth wireless technology. This has a price of $3,000. The Premium Package delivers the AVM, Bose stereo, Advanced Climate Control System (ACCS), dual occupant memory system for driver’s seat, outside mirrors and steering wheel, entry/exit assist for driver’s seat and steering wheel, outside mirrors with reverse tilt-down feature, auto-dimming inside mirror with HomeLink Universal Transceiver Maple interior accents, power tilt and telescopic steering column, 19-inch split 5-spoke aluminum-alloy wheels with 245/45R19 all-season performance tires, High Intensity Discharge (HID) xenon headlights, Adaptive Front lighting System (AFS) with auto-leveling headlights, 2-way power driver’s seat lumbar support, coat hanger on driver’s seat head restraint, 8-way power passenger’s seat, power up-folding 2nd row seats, meter hood with premium stitching. This group adds $4,400. My test vehicle had the lot and came to a total price of $50,080 after freight and PDI charges. 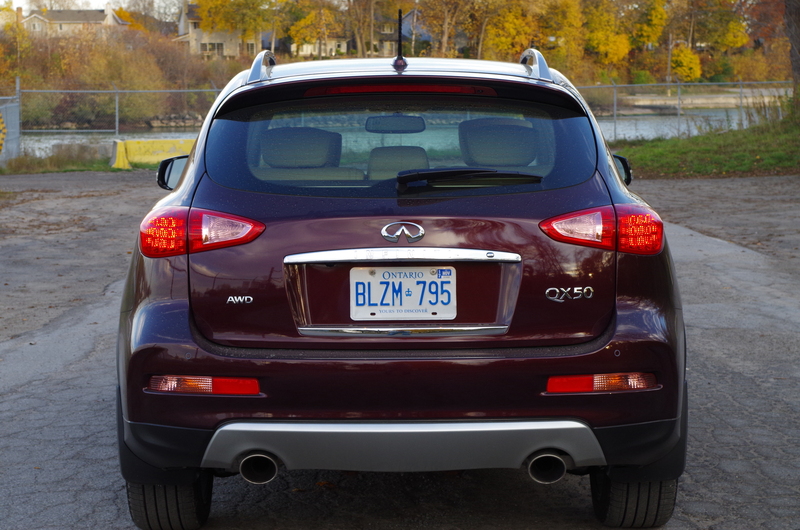 The base QX50 AWD has a relatively low price of $37,900 and still comes well equipped with that glorious engine, heated front leather seats and numerous other luxuries. 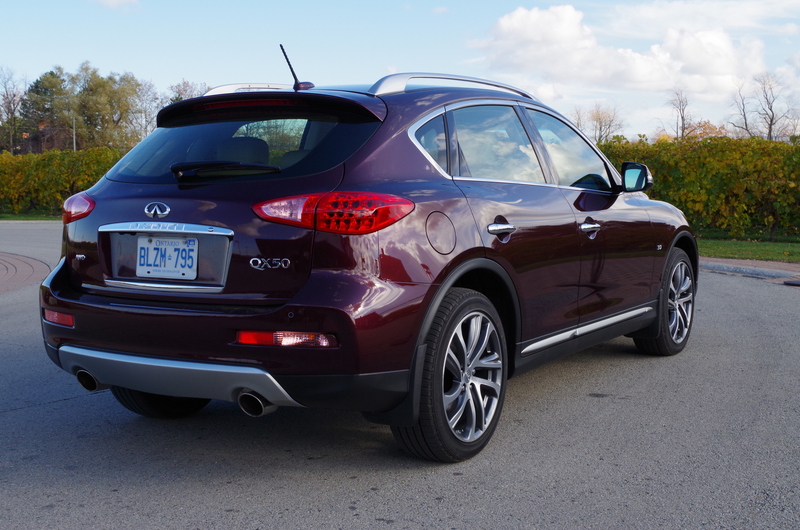 The 2016 QX50 AWD is priced below it competition, it is driver focused and handles very well. The only draw backs could be the smallish cargo area due to the coupé roofline and a style that has been around for a few years. 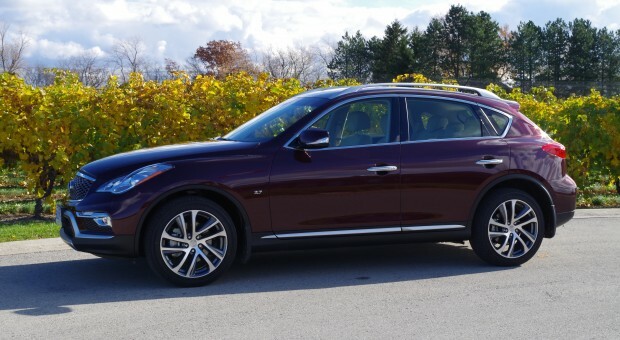 There have been rumblings that the next generation QX50 may be powered by a 4 banger, which in my mind makes this model year an even more enticing choice this may be one of the last of the great 6’s.